WASHINGTON, Oct. 30, 2017 /PRNewswire-USNewswire/ -- Two studies presented today at a research forum detail the intractability of opiate dependency, including among patients who are successfully rescued from overdose by naloxone, and offer insights into who is more likely to become opiate dependent. The studies were presented at the annual meeting of the American College of Emergency Physicians (ACEP), along with the results of a poll of 1,261 emergency physicians. 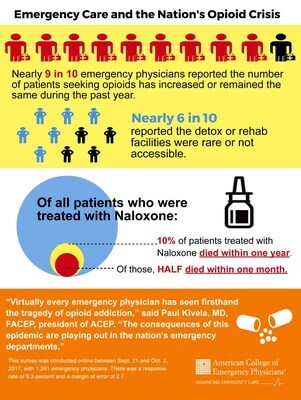 "Virtually every emergency physician has seen firsthand the tragedy of opioid addiction," said Paul Kivela, MD, FACEP, president of ACEP. "The consequences of this epidemic are playing out in the nation's emergency departments. Almost all the emergency physicians responding to an ACEP poll (87 percent) reported that the number of patients seeking opioids has increased or remained the same. More than half (57 percent) said that detox and rehabilitation facilities were rare or never accessible." According to one new study presented, despite the increased availability of naloxone — a medication that blocks or reverses the effects of opiate overdose — about 10 percent of patients treated with naloxone had died within a year of treatment. Half of those who died did so within one month of treatment. The study, conducted in Massachusetts, found that of patients treated with naloxone who died within one year of treatment, about 40 percent died outside the hospital. "Patients who survive opioid overdoses are by no means 'out of the woods,'" said lead study author Scott Weiner, MD, FACEP, assistant professor at Harvard Medical School and director of the Brigham Comprehensive Opioid Response and Education Program at Brigham and Women's Hospital in Boston, Mass. "These patients continue to be at high-risk for overdose and should be connected with additional resources such as counseling, treatment and buprenorphine." Another study presented at ACEP17 found a high correlation between early childhood trauma exposure and opioid-misuse. Indianapolis Emergency Medical Services created a quality improvement project to meet opioid-misusing patients in the emergency department and link them to ongoing care. The study detailing the results of that project found that a substantial portion of patients who come to the emergency department after surviving an overdose had high rates of other mental health diagnoses and exposure to childhood trauma. "In order to truly reach overdose survivors, we need a much better understanding of who they are and the many challenges they face when they seek care," said lead study author Krista Brucker, MD, FACEP of Indiana University School of Medicine in Indianapolis, Ind. "Designing and implementing effective outreach and referral programs will require listening carefully to patients and taking into account the impact of untreated mental illness, exposure to childhood trauma and many other medical and social determinants of health." In addition, Dr. Kivela said that prevention is the ultimate solution. "Emergency physicians are working on solutions, such as the Alternatives to Opiates Program at St Joseph's Regional Medical Center in New Jersey," said Dr. Kivela. "Policymakers also are focused on this epidemic. For example, Congress appropriated $500 Million under the 21st Century CURES Act in 2016 to battle the opioid crisis. It's important not to overreact, because people have legitimate pain. It took many years for us to get to this place, and it will take time to get out." This survey was conducted online between Sept. 21 and Oct. 2, 2017, with 1,261 emergency physicians. There was a response rate of 5.3 percent and a margin of error of 2.7. For complete poll results, please click here or contact Laura Gore at lgore@acep.org.